In order to focus attention on the dictatorial and imperial presidency of Obama, Alex Jones and the Infowars team have decided to launch a contest. Taking cues from the successful Obama Joker contest we held in 2009, the new effort will use posters strategically placed in lawful public commons areas to convey the obvious – the globalist puppet Barry aka Barack Obama is a tyrannical dictator who has willfully and continually violated the Constitution and betrayed the trust of the American people. Because a lickspittle corporate media has virtually ignored the significance of Obama’s treason, we believe it is crucial to raise awareness with a new poster campaign. Win $5,000 by producing a poster and a video of its placement in a lawful public commons area. 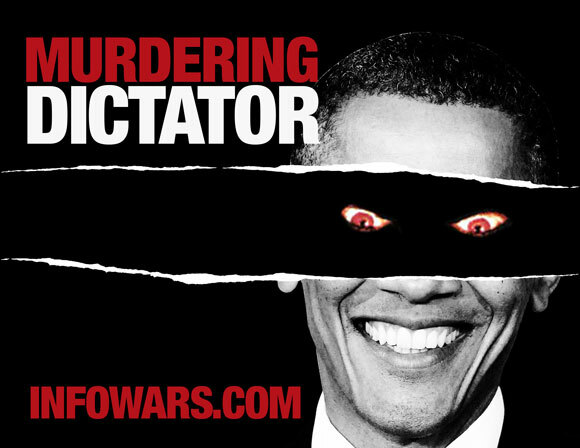 The poster must stress the tyranny of Obama and include the Infowars.com web address. 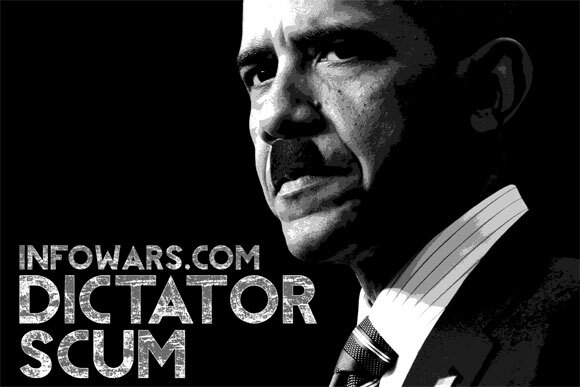 An example would be Obama festooned with a Hitler mustache or a likewise resemblance of classic totalitarian posterage (Mao or Stalin, for example). However, the sky’s the limit and we encourage you to get creative and come up with your own motif. 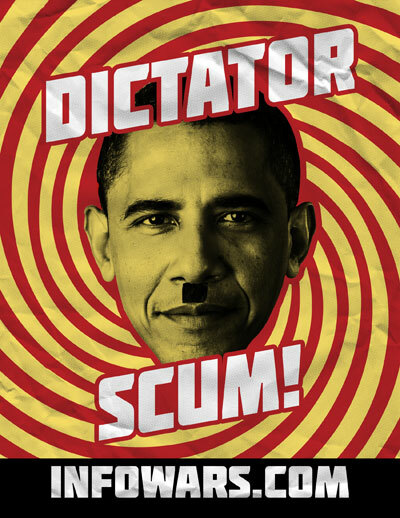 Alex has suggested the following cues to get you started: Rat Dictator Obama, Dictator Scum, Murdering Dictator, etc. Concentrate on Obama’s crimes and you’ll find the appropriate message. Again, remember to include the Infowars address. You can create your own poster or use ours (links to poster-sized images below). This is a package deal and the video presentation and its overall aesthetics and dynamic content are as equally important as the graphical impact of the poster and its message. Phase One is on a tight schedule. All video entries must be on YouTube or a similar video hosting platform by Friday, June 22, at midnight CST. Alex will announce the winner on Monday’s worldwide transmission. Same deal as above, but with a more expansive time-frame. The winner of this phase of the contest will receive a whopping $10,000. The deadline in July 6, 2012, at midnight CST. We can’t emphasize how important this contest is with a lackadaisical Congress and a compliant corporate media that either completely ignores Obama’s treachery or criminally glosses over it. For more details and inspiration, see It’s Official: Presidency Now a Dictatorship.